In what is probably the most misleading article title since the beginning of time, Naharnet tells us that “Aoun Links Cabinet with Presidential Elections, Says he Nominates Geagea“. In the same context, Berri apparently said that he won’t deal with the matter before March 25, when the 60-day Constitutional deadline for the election of a new president starts. But since every possible politician is talking about the presidential elections, I find it hard how he’ll manage to do that. So what is exactly happening 5 months before the 25th of May? Mini-heart attack yet? Don’t panic. 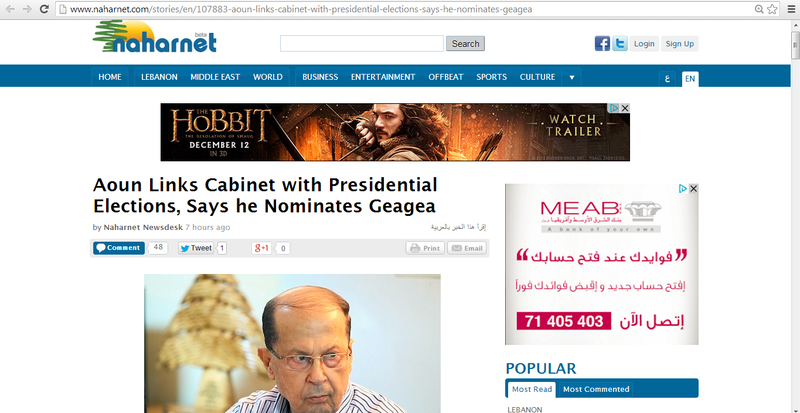 Aoun isn’t actually going to nominate Geagea (Naharnet forgot to put the word mockingly before says in the title). However, Aoun said that he wants a strong president and he clearly won’t nominate Geagea (since he mockingly nominated him). On the opposite side, he is distancing himself from his ally (and apparently presidential rival) Sleiman Frangieh by asking for the election of a president from the first round (requiring the two-thirds of votes) while Frangieh previously said that he had no problem in electing the president with absolute majority (Here’s a nice post from October explaining why). Meaning that Aoun is likely to nominate someone from the FPM (him?). Frangieh and Aoun are endorsing two different electoral strategies, meaning that they will probably not be endorsing each other. This small competition is only the beginning. There will come a time where other M8 parties will have to choose between Frangieh and the Aounist candidate . So with who will side Hezbollah? The whole confusion emerging from within the March 8 coalition also means that the other centrist parties would have a much more free hand and will be more able to distance themselves from the March 8 camp or put conditions on the shattered M8 alliance. Jumblatt and Mikati in stronger positions also means that the president would be in a better place in case he wishes to extend his mandate. March 14’s silence and Tammam Salam’s passivity show us that the deal – if a consensus is to be reached – won’t strictly be about the government but rather the whole crisis, and its recent newcomer: The presidential elections. Did I miss anyone? Correct! Jumblatt’s quiet attitude for the past few weeks – only 3 weeks earlier he was engaged in a violent media war against M14 and M8 – indicates that everyone is considering his options. After all, Jumblatt is still the kingmaker, and his stances will with no doubt influence everything. In fact Jumblatt’s silence is probably behind most of the parties’ cautiousness. No one wants to rush to the losing side. And the identity of that side will be clearer once Jumblatt takes a decision. If you’ve been following the news this week you’d be aware of the student elections in USJ and their violent aftermath (see here, here, here). One must keep in mind that USJ is one of the biggest and most prestigious universities in Lebanon, and its political relevance comes from the fact that it is a Christian University mostly attended by Christian students. Other than the demographic cause, the campus where most of the trouble happened is in the heart of Ashrafieh, while the University itself is the Alma mater of roughly half of the Lebanese presidents. That’s why the university elections at USJ matter more – strategically speaking – to the Christian leaders than the elections at the Lebanese University, AUB, LAU or any other university. Although the tensions are more of a yearly tradition now, this year I can’t but relate the unusually high tensions (Classes were suspended for two days in Huvelin campus) to the near presidential elections. For the reasons stated above, whoever the winner is at USJ , it’s a huge boost for him ahead of the presidential elections. Probably explains why Aoun lashed out at Geagea and why Samy Gemayel entered in a media / propaganda war against Michel Aoun and M8 following the elections. Reminder: We still don’t have a government. Don't forget to follow @moulahazat on Twitter for updates on new posts! Posted in Lebanese Politics, Michel Aoun, Michel Sleiman, Politics, Presidential Elections, Samir Geagea, Sleiman Frangieh on December 1, 2013 by Ramez Dagher.